The Russian Tsvetnaya Bolonka is a small companion breed that originated in Russia and later developed primarily in Germany. Their name roughly translates to Russian Colored Lapdog or Colored Bichon. A member of the bichon family, the Russian Tsvetnaya Bolonka's closest relatives are the Bichon Frisé and the Bolognese. It is believed that the Russian Tsvetnaya Bolonka is descended primarily from French dogs similar to the Bichon Frisé or Bolognese that were brought to Russia in the 18th and 19th centuries. These small white dogs were the favorites of the upper class and royalty throughout Europe at the time. After the Russian Revolution these dogs became isolated from outside influence and began breeding only with dogs already inside Russia’s borders. 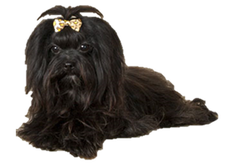 It is believed these mixes included breeds such as the Lhasa Apso, Toy Poodle, Shih Tzu, Yorkshire Terrier, and Pekingese, although it is likely any small fluffy dog (purebred or mix) was added to the bloodline. After World War II dog breeding inside of Russia began to be taken more seriously for breeds that were not strictly utilitarian. This caused the popularity of these little dogs to grow, however they were not allowed to be exported from the country. Eventually in the late 1970s some breeding dogs were obtained inside Germany and the bred became standardized. At one point the Bolonka was considered to have two varieties, multicolored and solid white, but the Fédération Cynologique Internationale deemed the white variety simply a variation of the Bolognese. The pedigrees of these dogs were adjusted while the Russian Tsvetnaya Bolonka continued down its separate path. Today the Russian Tsvetnaya Bolonka remains unrecognized in most countries, although now that it has been accepted into the American Kennel Club's Foundation Stock Service this is likely to change. Is the Russian Tsvetnaya Bolonka Right for You?